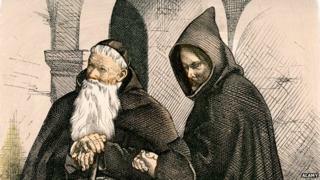 Author Jeremy Clay tells the macabre story of the grave-robbing monks. From the moment he saw her, he was utterly transfixed. But it wasn't love at first sight that sent the widower's heart racing, and nor was it lust. He couldn't care less for the stranger's looks. No, he only had eyes for her frock. And the longer he stared, the more certain he became. That dress she was wearing. It wasn't just similar to his wife's favourite gown, it was the exact same one. He'd know that silk dress anywhere; his poor wife had adored it, which is precisely why she'd worn it to the grave a few weeks before. With distress mixed with disbelief, the still-grieving soldier demanded to know how the peasant woman came to be parading around in a robe which was a) fancier than she could afford and, more pressingly, b) supposed to be six feet under the ground, adorning a corpse. Her answer uncovered a trail of guilt that led to the lair of a rather unlikely set of criminals. And so, on an autumn day in 1874, a body of policemen headed purposefully towards the Capuchin monastery in the Sicilian town of Barcellona Pozzo di Gotto. At their head was the local magistrate, and he was eager to speak to three friars who tended the town's cemetery. They, it soon became clear, were less keen to speak to him, but there was no use protesting their innocence. The incriminating evidence of what British newspapers called their "odious profanation" was quickly nosed out. Half-destroyed coffins. A jumble of clothing. Slippers. Women's hair. The burial booty of the bodies they were meant to safeguard. It was, according to the Edinburgh Evening News, a "story illustrative of the low morality of the Sicilian priesthood". "Night after night the three brothers went down into the vaults," explained the paper, "exhumed the dead bodies, and after having stripped them of all they had on, returned with their spoils, including even the coffins, to a secret chamber in the monastery. "The coffins they converted into tables, which were sold with the other effects through subordinate agents. This horrid traffic had been going on for years." The monks were convicted and marched off to prison, "amid the curses of the populace", noted the Evening News. And the dress? The paper never got round to saying what became of that, but there's a good chance it had lost much of its cut-price allure.